Dog Coat Grizzly II will definitely put an end to beautiful winter walks ended early because your faithful friend is shivering with cold and damp. 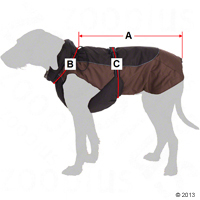 Dog Coat Grizzly II makes long walks in the cold and wet season a pure joy for dog and owner. A functional multilayer system protects your dog from wind, rain and dirt. The breathable, cosy fleece lining and embedded padding will ensure perfect heat insulation and maximum well-being. Reflective strips on the coat and the strap provide safety for you and your dog on evening walks. A continuously adjustable belly strap and drawstrings at the neck ensure that the coat can be adjusted to your dog’s individual fit. Additional leg loops keep the coat from sliding and flapping at the back. The functional Dog Coat Grizzly II is a top choice to guarantee well-being in the wet and damp of autumn and winter. An absolute must for senior dogs and dogs with thin undercoats! Measure back length (A) from the lowest point on the base of the neck to the tail head. Measure neck circumference(B) at the lowest point on the base of the neck. Measure belly circumference (C) immediately behind the ribcage. This entry was posted in Dogs, Products in Focus and tagged coat, dog, dog coat, winter by katieh. Bookmark the permalink.